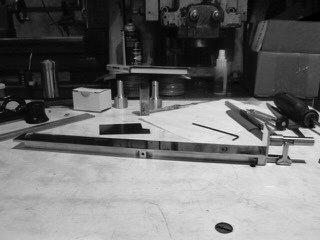 On Saturday, I received these pictures from Jon Spencer, the machinist fabricating the mechanisms for this project. 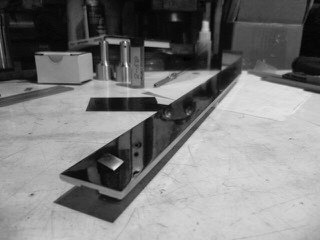 The main box latch assembled, side view. Jon is, as you can see from these images, extremely talented. Concerned about the integrity of the long lever, he re-engineered it to withstand the load. This is the latch that gets everything started. 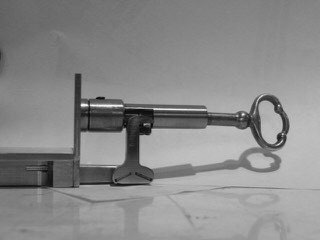 A key is inserted into the right side of the table, as you look at it, and turned. The tooth on the end of the key connects with, and lifts a hook on the end of the lever. 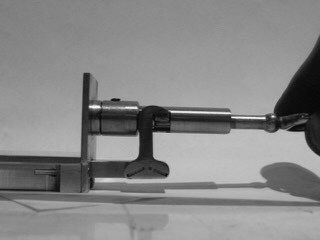 This, in turn, withdraws the bolt from a mortise in the main box. With nothing holding the main box in place, the spring drive mechanisms in each side of the carcass propel the main box forward and the top rearward simultaneously. A view of the key in the lock end of the main box latch. A view of the key engaged in the main box latch. This piece looks fantastic! I can’t wait to install it in the prototype. Unfortunately for us with high quality craftsmanship such as this, Jon is in great demand. This is a special commission for him, which he continues to work alongside his other projects. I will post updates as he makes progress on the remaining parts.